These images were taken by J. D. Brown during the reading to ravens performance that I did in Banff, Alberta today. 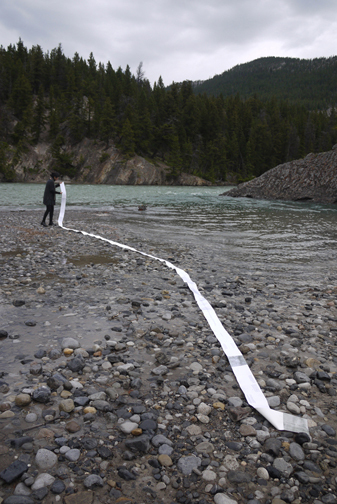 Using a recent looped line version of my long storypoem A Young Girl, a Young Woman, and a Woman Nearing Sixty (which was completed and printed in March 2013), I wanted to do a performative reading where the Spray River meets up with the Bow River. I first began working on this storypoem on October 29, 2010 while living in Washington, D.C. and continued to shape and rework the text during the following year. The first bookwork version of the storypoem was completed in October 2011. 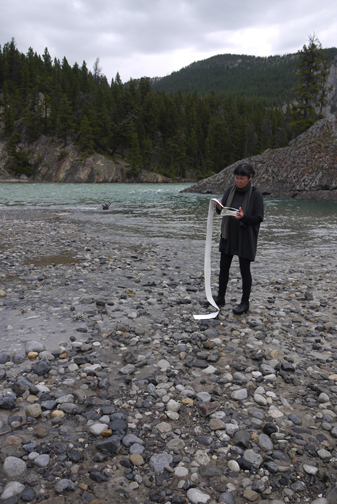 I did two more performative readings of reading to ravens today in Yoho National Park. The first on the bank of the Yoho River and the second one up at the base of Takakkaw Falls. These two readings as well as the one I did in Banff earlier were videotaped, so that I could use the footage as a means for working out the next stage of this project. The still and video images becoming material for me to ponder, to play and experiment with, as a way of “thinking” through the process of developing this part of wings walking water. I will post an image or two from these readings as soon as I have a chance. At the moment we are still on the road, winding our way back home, from a city’s flood to the sea. 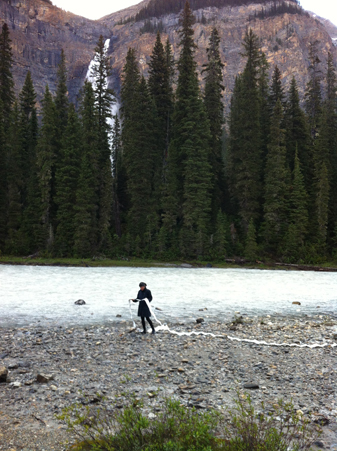 This is one image that J. D. Brown took with his cell phone, as I read on the banks of the Yoho River. No stills were taken while I read at the base of the falls. 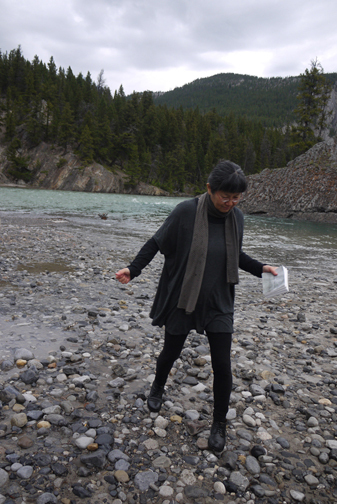 Takakkaw Falls has been a meaningful place for me, for many years. Each time we have visited in the past, I’ve walked up into the spray and have felt the power and the spirit of these waters. Even so, on this particular visit the strength of the wind created by the falling waters took me by surprise. I had difficulty even hanging on to the bookwork. The wind whipped and pulled at the pages as they moved out from my hands while I read. A Young Girl, a Young Woman, and a Woman Nearing Sixty wouldn’t sit quietly. My biggest fear was that sections of the bookwork would tear away. The water’s wind took hold of pages, weakening the seams with each yank and turn. I could feel the story and the paper’s strength and vulnerability, simultaneously. I didn’t want to stop reading but I also didn’t want the storypoem to get carried off into the rushing water. I didn’t want to litter this beautiful spot. I managed to do the full reading (which was close to eighteen minutes) without littering. Soaked. Happy. I returned home with my torn and muddy bookwork and with lots to ponder, in terms of process and carrying on.